It is another sunny start to the day. The trucks are still there and engines still running. After breakfast we pack up and say goodbye. 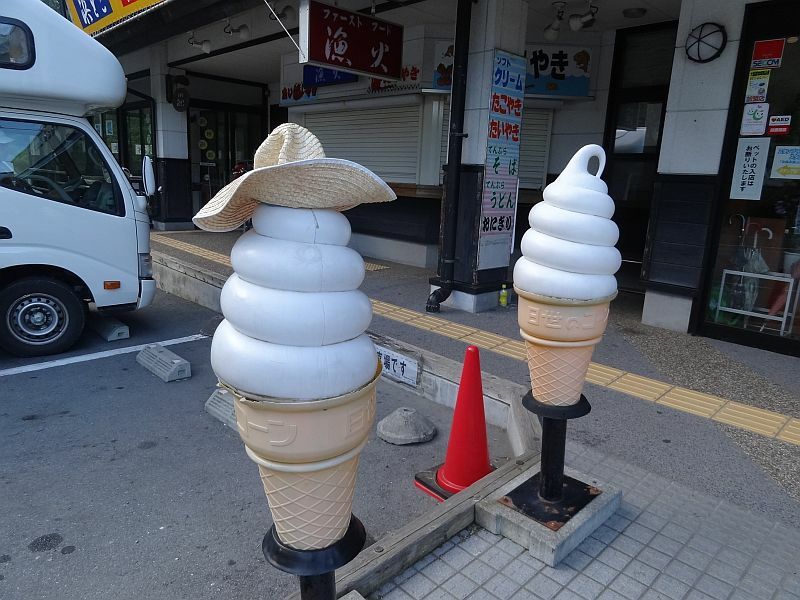 Later I see a straw hat on an ice cream cone! I think it belongs to Tadayuki. Immediately after leaving the road station Route 45 splits into a car only road and one for the rest of us. 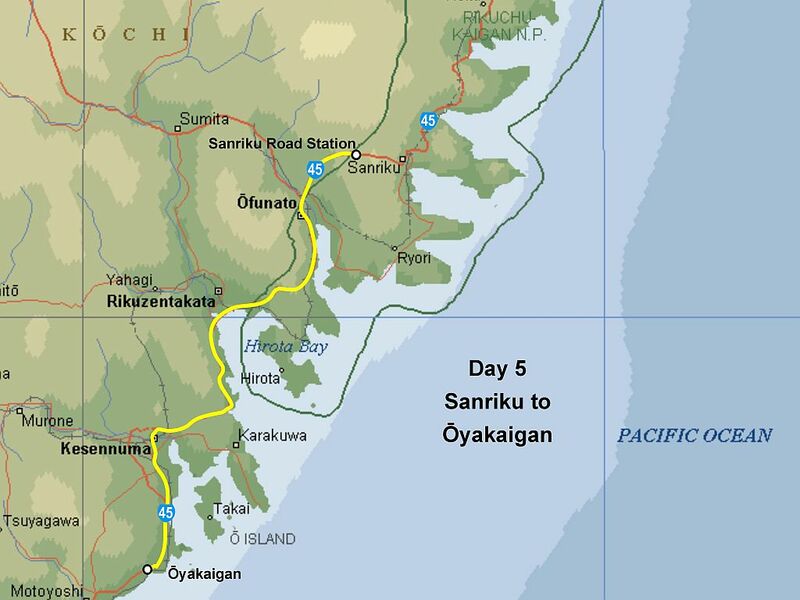 Given we are so high and it is so early I consider using the car only road, guessing it is probably mostly downhill to Ōfunato and so a quick passage. Decide not to, hoping the top is near anyway. Wrong, there is a considerable climb, at the top of which is a tunnel. 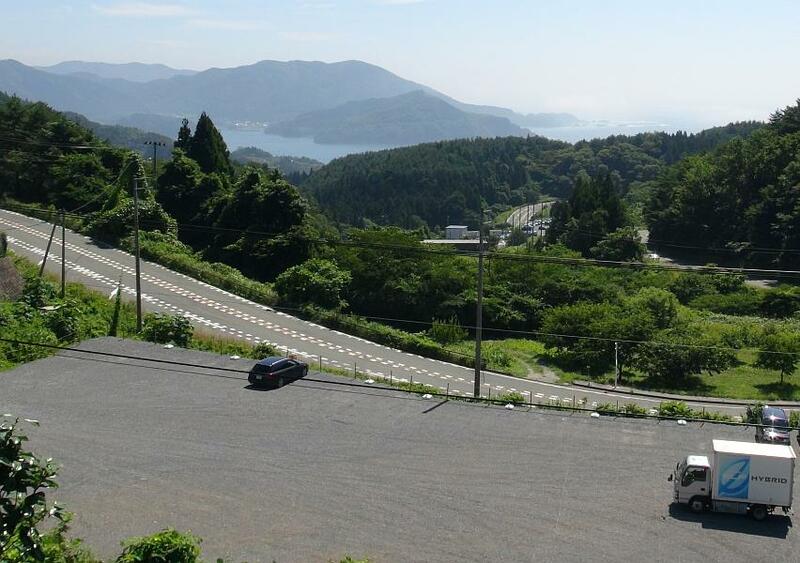 Nice views out the other side and then a long descent to Ōfunato. 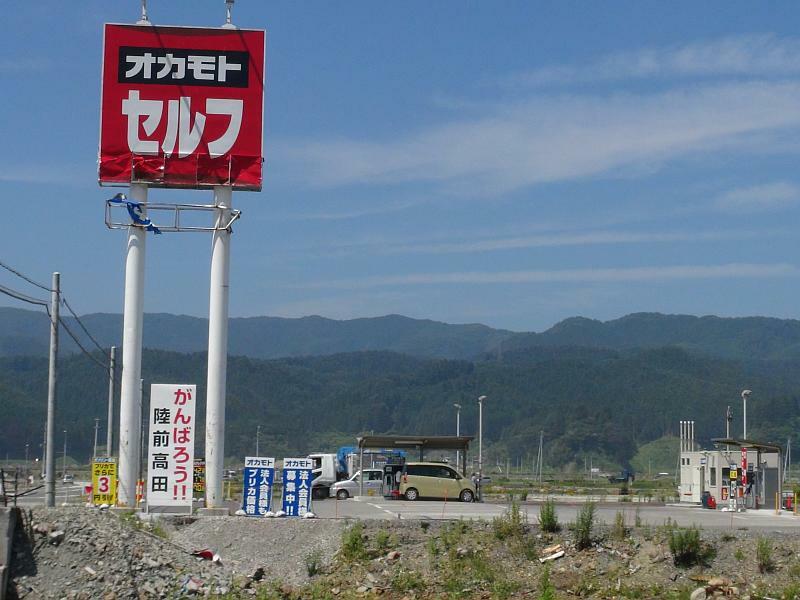 At the far end of the town is a turn off to Prefecture Road 275 along which a campground is located, but it is too early for me to stop. 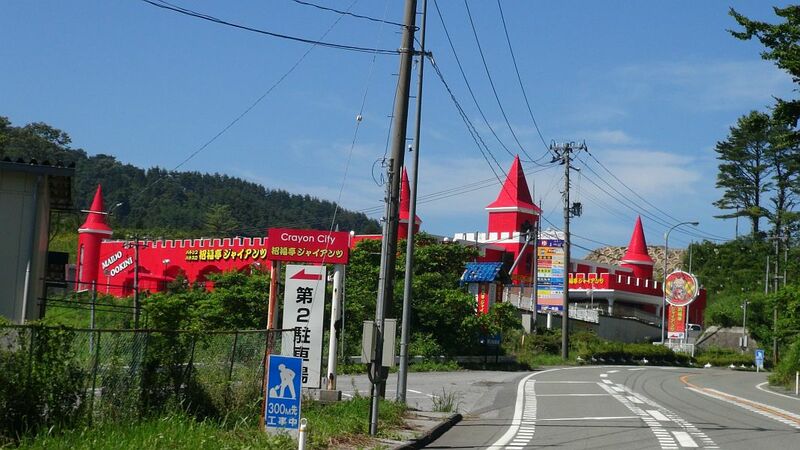 On the way to the top of the next (steep) hill pass a strange looking building, bright red called Crayon City, perhaps it is a pachinko parlour? Pass through more tunnels and cross more hills. 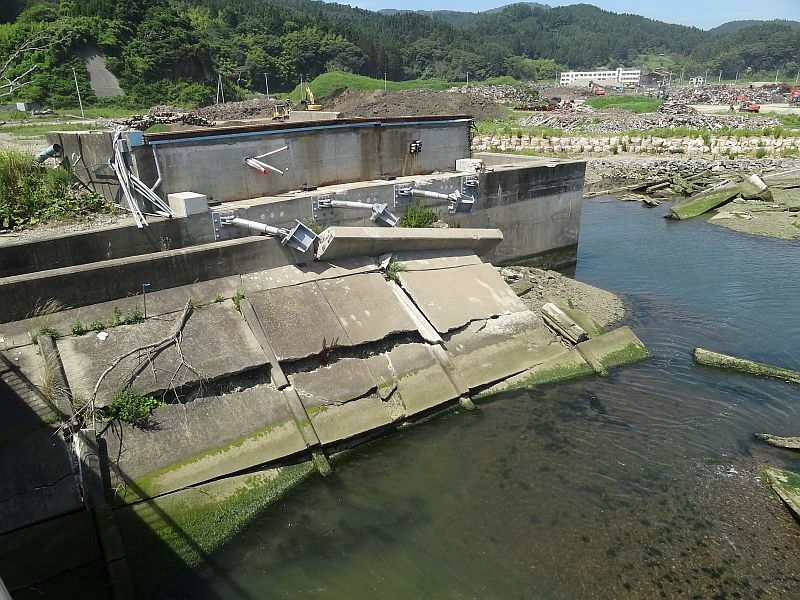 Down to Rikuzentakata. 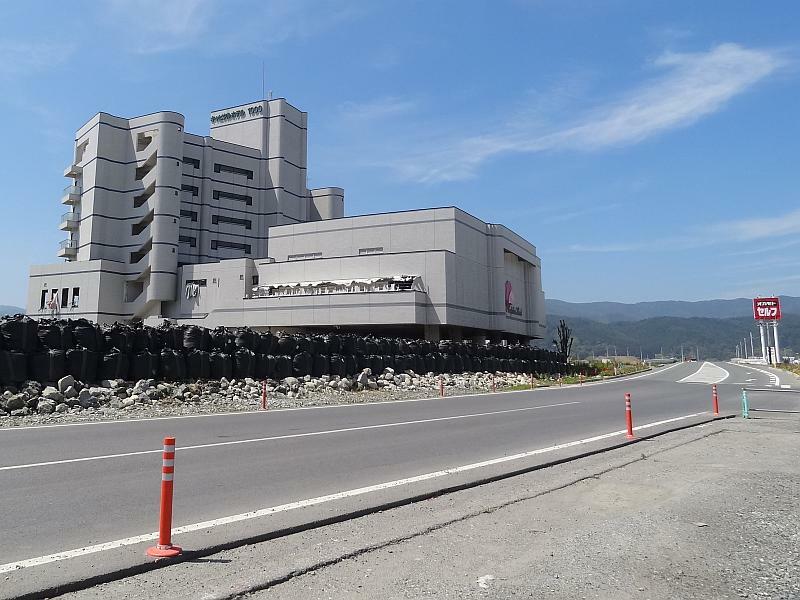 Pass the impressive but badly damaged Capital Hotel 1000. Most other buildings have disappeared around here but there is a petrol station sign with what looks like a tide mark, a good 6m above the road. Shortly afterwards come across a man and 4 ladies busy working amongst the roadside vegetation. I’m hungry so stop to ask if they know of a convenience store nearby. They say maybe 3kms away, they offer to take me in their car but I decline, I have some emergency food if I get desperate. 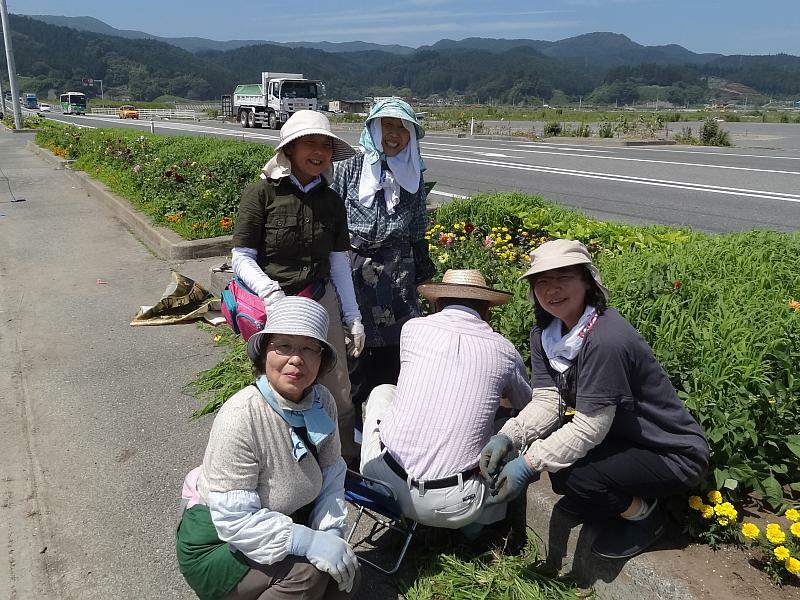 They are volunteers from Morioka. After a few minutes chat I ask if I can take their photo, “yes” but sensei is too busy to stop. 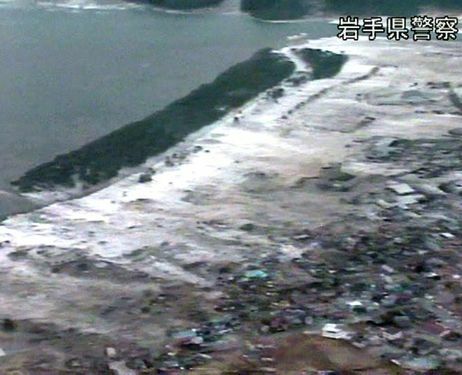 Prior to the tsunami Takata Matsubara had an estimated 70,000 pine trees. Their age is believed to be over 200 years old, they were planted as a shelter belt. 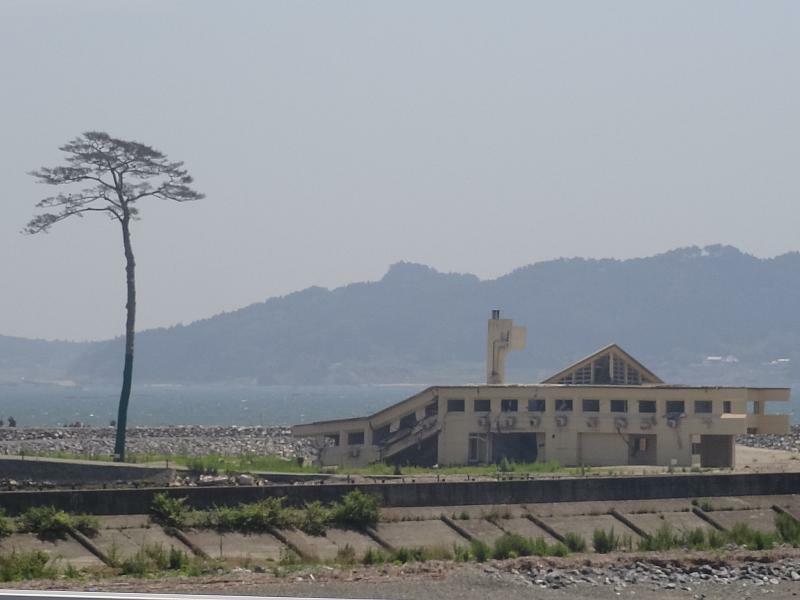 Sad to say that the latest news is the lone pine tree of hope has died, probably due to salt water contamination. 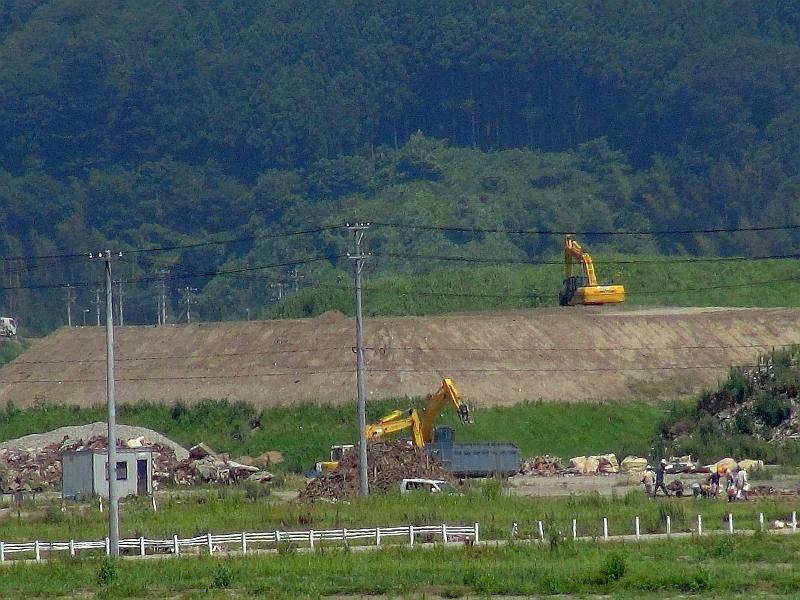 Not only had the trees disappeared but the land on which they stood. 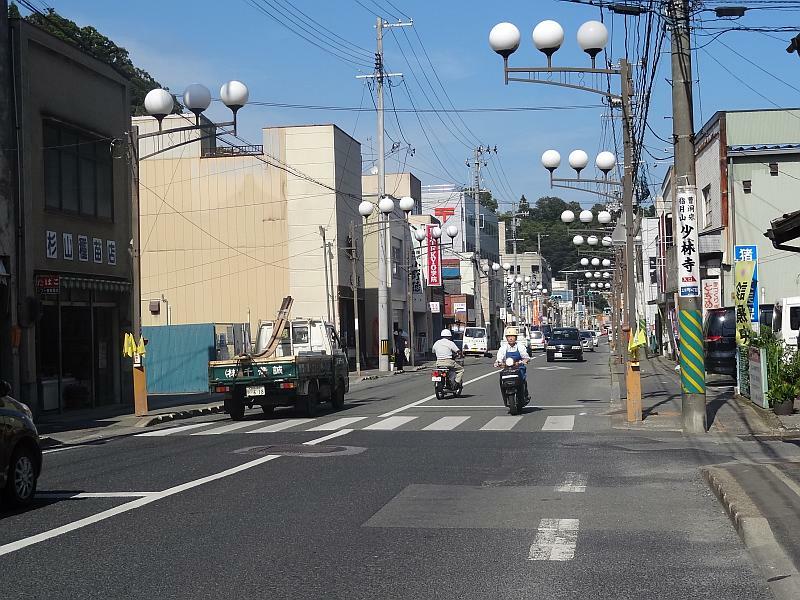 Route 45 bypasses Kesennuma so I turn off and go through the town centre. 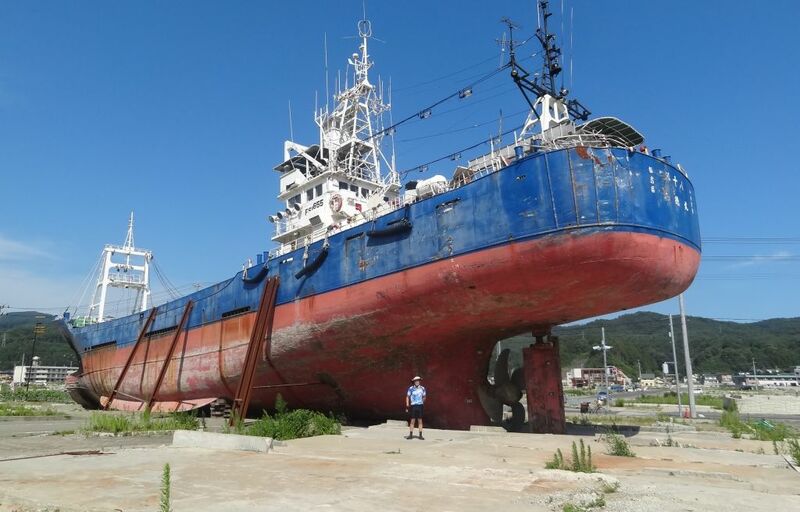 A short time later I arrive at Kyotokumaru, a large fishing boat high and dry on the roadside in clearly what was once a built-up area but is now just foundations. 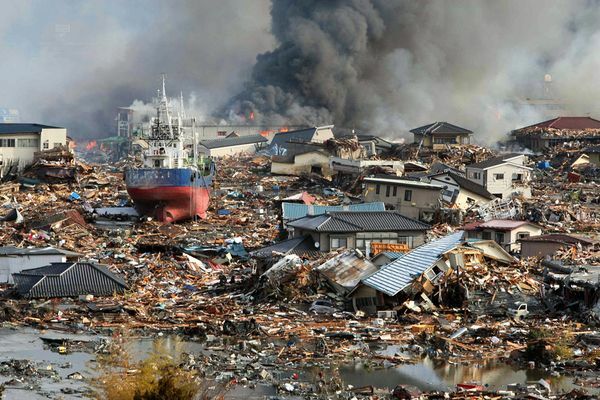 I understand it is going to be a permanent memorial so future generations do not forget. Judging from the number of people stopping, it is becoming a popular tourist attraction. 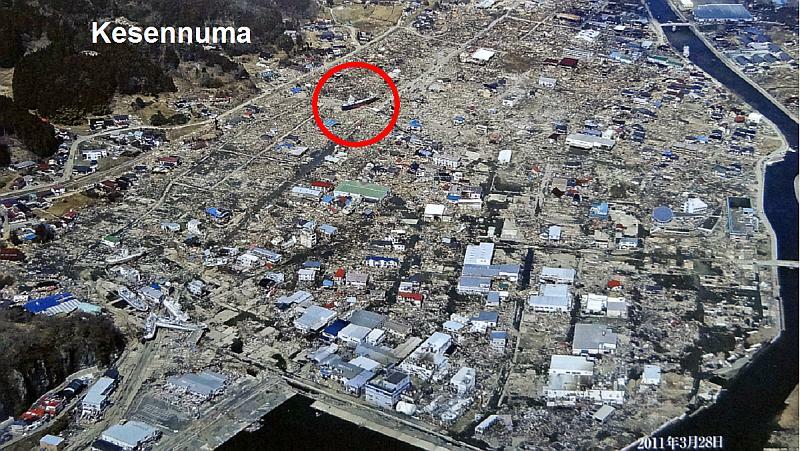 Ariel view of Kesennuma after tsunami (red circle indicates ship). Stop to eat then continue south. 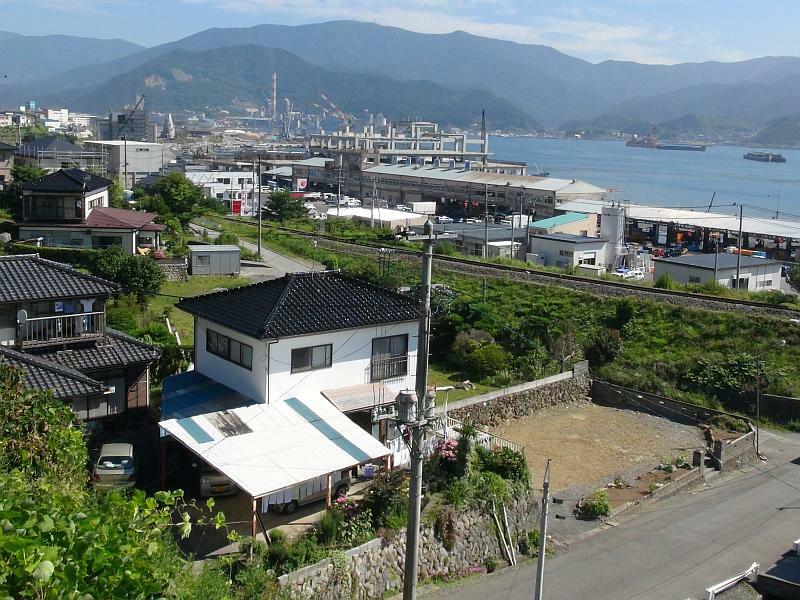 A few minutes after leaving Kyotokumaru, Kesennuma returns to a typically normal town again. 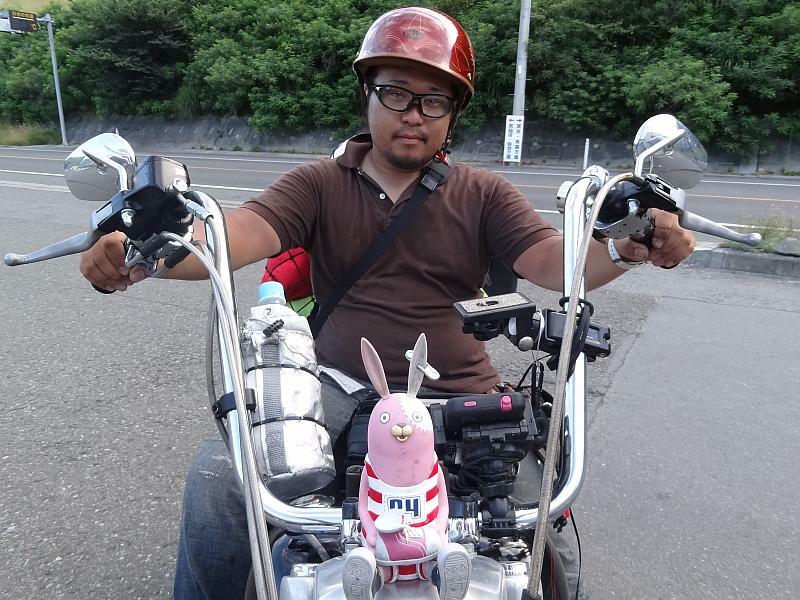 Over another hill and drop down to Ōyakaigan. The road station is where the railway station is, or was. 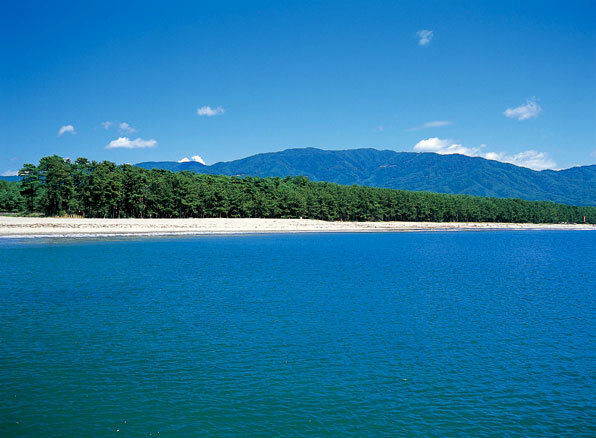 It was known as the closest station to the sea, and it is now a little closer. 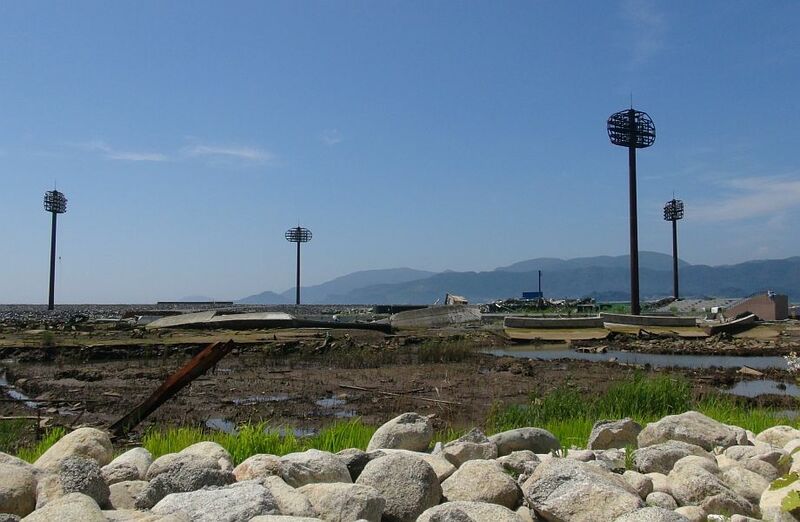 The unused main building and platforms are still there but bridges, rails and other infrastructure have gone. Arrive just before it closes for the day. No there are no nearby campgrounds, “Can I camp here?” Iask, “Yes, but where?” I say on the station platform behind the road station, no it is not allowed. 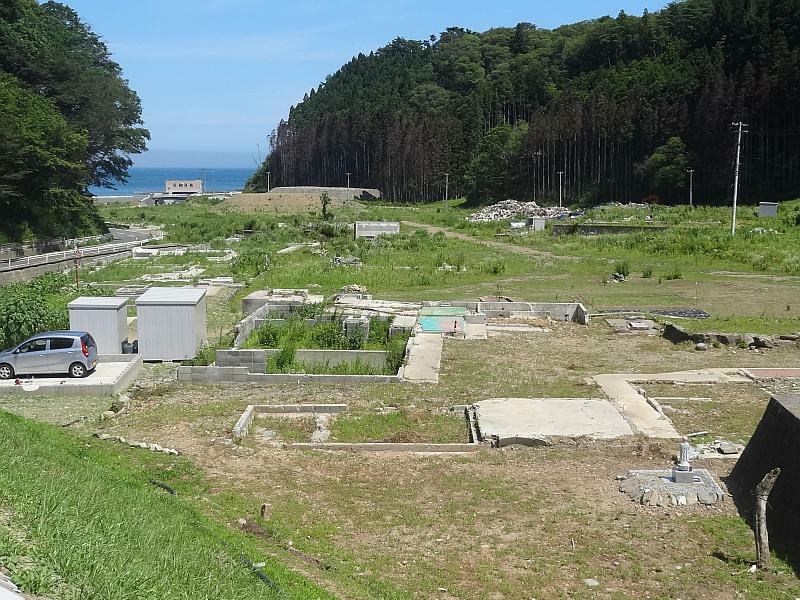 What about on the foundations of the swept away buildings? OK. When all the other staff have left, the lady working late brings me a hot coffee, thank you! I am surprised how good it tastes! Put up tent, then lie down for a few minutes. The concrete underneath radiates heat from the sun. Wake up around 3:00am still wearing my clothes and even my cycling gloves! Didn’t even prepare the inflatable pillow. I’m too sleepy to do anything about it now. It is another short day. 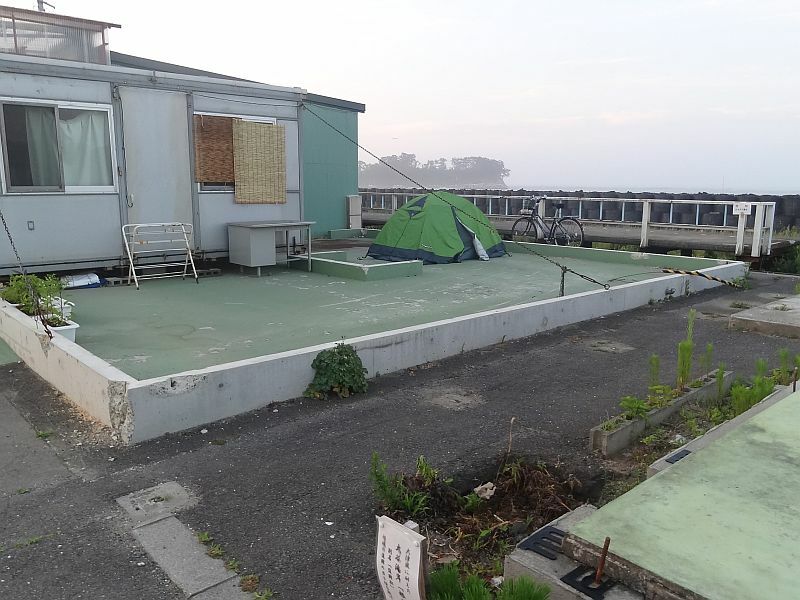 I’ll never get to Sendai are this rate!